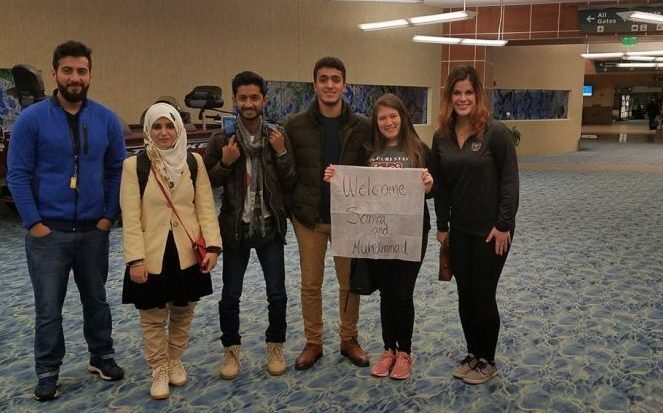 Samra (second from left) and Mohammad (third from left) were greeted at the airport by current Missouri State students and International Services Coordinator, Julia Baer. Missouri State University is pleased to welcome new international students to campus as part of the U.S. Department of State’s Global Undergraduate Exchange Program in Pakistan (Global UGRAD-Pakistan). Samra and Mohammad joined the #InternationalBears family in January 2019. The Global UGRAD-Pakistan program places participants at U.S. colleges and universities for academic study. It’s part of a broader U.S. Department of State effort to promote better understanding of the United States abroad, particularly among future world leaders. Since the program’s inception in 2010, Global UGRAD-Pakistan has provided more than 1,600 talented, highly-motivated undergraduate students from underserved populations across Pakistan with the opportunity to study at a U.S. college or university. Through semester-long academic study, exploration of U.S. culture, participation in community service projects, and interactions with Americans in their host communities and campuses, Global UGRAD- Pakistan participants develop expertise in their academic fields, gain a broad and nuanced understanding of American culture and values, and go on to share this understanding of the United States with their communities when they return home. Over the past eight years, participants have volunteered over 34,000 hours with community organizations across the United States. Global UGRAD-Pakistan participants enrich the lives of the Americans they meet by sharing their unique viewpoints and backgrounds and bringing a global perspective to their host communities. These ties endure, with over 95% of program alumni maintaining relationships with Americans they met while in the United States. Global UGRAD–Pakistan is a program of the U.S. Department of State’s Bureau of Educational and Cultural Affairs (ECA) with funding provided by the U.S. Government. The Program is administered by IREX. For more information about the program, visit: https://www.irex.org/ugrad-pakistan. The U.S. Department of State’s Bureau of Educational and Cultural Affairs (ECA) fosters mutual understanding between the people of the United States and the people of other countries. The programs promote friendly and peaceful relations, as mandated by the Mutual Educational and Cultural Exchange Act of 1961. ECA accomplishes its mission through a range of programs based on the benefits of mutual understanding, international educational and cultural exchange, and leadership development. Exchange program alumni encompass over one million people around the world, including more than 80 Nobel Laureates and more than 575 current and former heads of state and government. For more information about ECA exchanges, visit http://exchanges.state.gov. For press inquiries please email ECA-Press@state.gov. IREX is a global development and education organization. We strive for a more just, prosperous, and inclusive world. With an annual portfolio of $80 million and 400 staff worldwide, we work with partners in more than 100 countries in four areas essential to progress: cultivating leaders, empowering youth, strengthening institutions, and increasing access to quality education and information. For more information about IREX, visit www.irex.org.